ELEX WooCommerce DHL Express / eCommerce / Paket Shipping Plugin with Print Label is the DHL shipping integration for WooCommerce. Built with Official DHL Partner, the plugin is fully compatible with the Wooommerce 3.0. Having its basic version running on 2000+ WooCommerce stores, most of its features are known to the users. And when you switch to the premium version you get a lot of additional features like custom boxes, label printing, and tracking. But the premium version of the plugin is so extensive that its users often miss a lot of features. These features can add convenience, compliance, flexibility in payments, transparency, and ease to your shipping processes. Let’s explore each of these features one by one. This will help you make a better use of the available services. These services are offered by DHL at no extra cost. making them more valuable for users. DHL offers the service where it collects packages from the shipper address. This is usually termed as a pickup. DHL offers pickup services on request. Inthe case of WooCommerce, you can use this plugin and schedule pickup for all your shipments. You can set time when you want to schedule a pickup by DHL. Navigate to Dashboard> WooCommerce> Settings> Shipping> DHL Express> Label & Tracking> Pickup to enable pickup. Once you ‘enable pickup‘ you get to enter the number of days, specific time slot and a person’s details who can be contacted in case of queries. This information is sent to DHL, with each shipment you create with DHL. So, if you create a shipment of Friday and you want a DHL pickup on Monday, schedule the pickup after 2 days. To make it more streamlined enter a time of availability in 24-hour format. Finally, enter a person’s details who can assist DHL at the time of pickup or can be contacted for the same. This remains valid for all shipments created after you enable pickup. You can always edit these values and change the frequency of the pickup. You get all of these with no extra charges from DHL. Special services refer to the shipping services offered by DHL for a product which is restricted or considered dangerous for shipping. If you specify the type of special service for a product, DHL treats that product according to the service requirements. For instance, if you ship alcohol, DHL ensures that you have all related documents and help you in meeting the packing standards. So in any such situation, you should specify product type of product you are shipping. Doing so you can also print a label that has compliance warning printed on them. You’ll find the special services in the ‘Label & Tracking‘ tab of DHL Express settings. Any service you choose here will assign it as the default special service. And this will print the compliance statement on each label you create based on that service. You should select a default service in case you deal in a single type of product like alcohol, lithium ion, or consumer goods. Otherwise, choose ‘NONE‘ and move to the respective products and assign a distinct service to them. 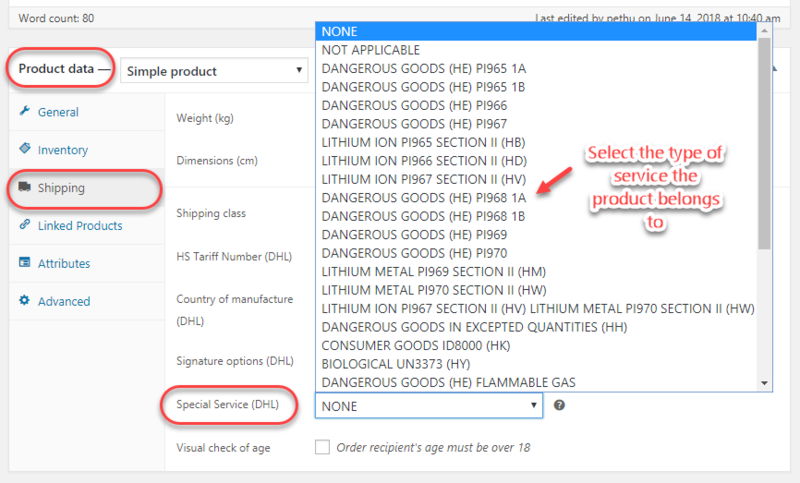 Selecting a default service to represent the products in case they are restricted or other dangerous goods. This remains the default service for all products. If you don’t want a default compliance warning on each of the labels, you can do a separate product level selection. To do it navigate to Dasboard> Products> All products> Select the product> Product Data(Shipping)> Special Service (DHL). Here you can select the service type of that particular product. Here is an example of a label created when you select one of the special services. 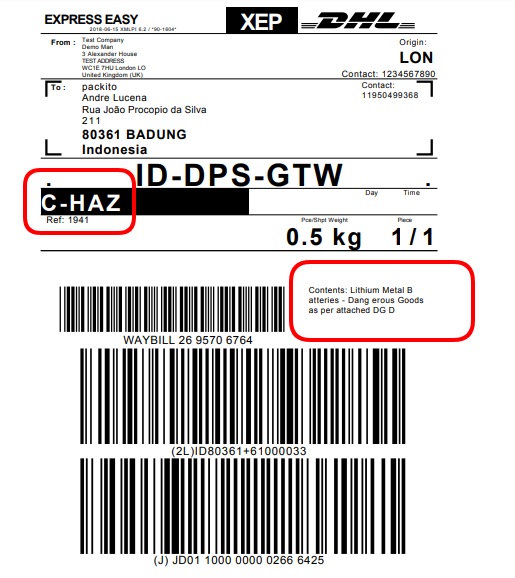 In this case, we have C-HAZ, depicting the hazardous goods in the package. Further, we have the content description where it says “Contents: Lithium Metal Batteries- Dangerous Goods as per attached DG D”. If you are still unsure, refer to our tutorial for printing correct waybills via WooCommerce DHL shipping plugin. Duty is the tax that customs authorities charges for importing products either from other states or countries. These can vary from country to country. Since shipments are shipped via DHL, it includes these duties in the shipping charges. These depend on the type of product and the location the product will reach. So with DHL, you can choose who pays for these duties. There are different ways you can pay for import duties while shipping with DHL. You get three options of how you wish to pay for the duties chargeable during the process of shipping. First, you choose the ‘Shipper‘ to pay for the duties. In this case, DHL collects the duties form the shipper while it collects the shipment. Second, you can choose ‘Recipient‘ in case you want your customer to pay for the duties. This is quite helpful for store owners in case of Cash On Delivery when customers pay for the products at the time of delivery. So, you have to enable Cash on Delivery in the Label & Tracking tab of DHL Express settings. If you don’t offer cash on delivery, you can still let the customer know the amount of duty through the next feature of ‘Show Break-Down of Shipping Charges’. Third, use third party/Other to pay for the duty. Use this option if the shipper or the recipient is not paying for the duties. As you select this option, you get to enter the account number of the person who is going to pay for it. Enter the account number of the person who pays for the duty. Shipping charges may sometimes include different expenses and the service providers keep an account of them. So you have the breakdown of all the charges associated with the total shipping charge. These include the weight based shipping charge for the package and the handling fee charged by DHL. It includes taxes and duties too. If you want to show a break down of shipping charges to your customers in the cart/checkout, you need to enable ‘Show Break Down Charges’. 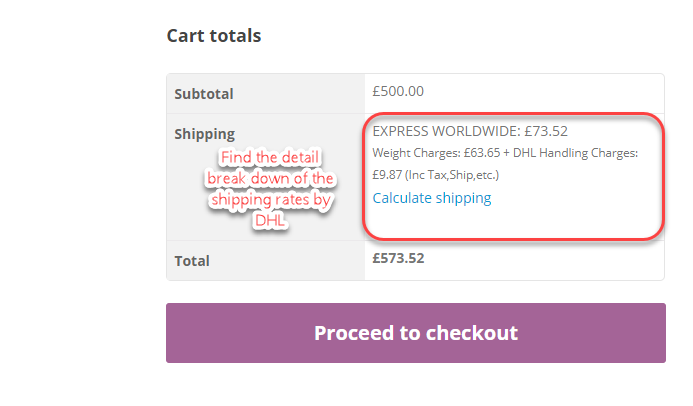 To find this option navigate to Dasboard> WooCommerce> Settings> Shipping> DHL Express> Rates & Services and check the box corresponding to Break Down Charges(screenshot below). Enabling Break Down of shipping charges to appear on the cart and check out pages. Once you enable this, customers get to see the breakdown of shipping charges on the cart/check out. Break Down of Shipping Charges on the cart page. UTF-8 or Universal Coded Character Set Transformation Format – 8-bit, is the best character encoder for the internet and is available on most web pages. It can encode characters from one to four 8-bit bytes. With this much of width variation, it can be used to encode even the most complicated characters including Chinese Korean and Japanese. It is also used for encoding emojis and mathematical symbols. 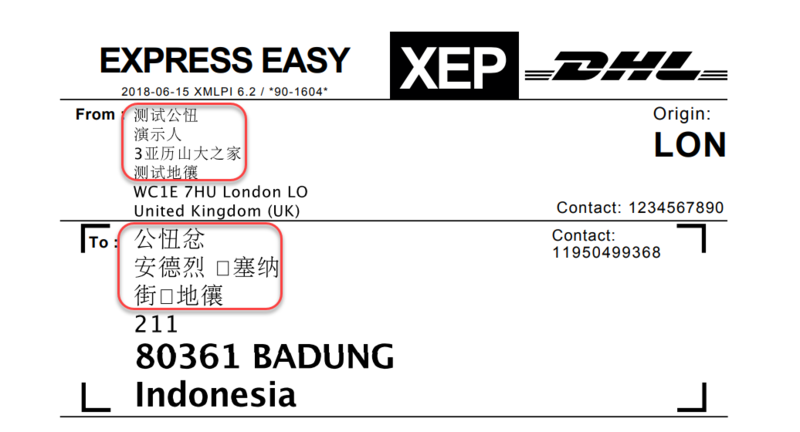 You can enable this feature to print invoices with characters from languages like Chinese, Japanese and Korean. To enable navigate to Dashboard> WooCommerce> Settings> Shipping> DHL Express> Rates & Services and then enable UTF-8 Support. This helps to encode these characters on the labels with ease. So if you are based in China, Japan or Korea and want to print labels in your native languages, switch to DHL and start printing labels in your language. As you might have noticed a few of these features before, but most of these are usually missed by users of the plugin. The features like pickup help you add convenience to your shipping activities, special services complete the compliance needs of the packages. Options for duty payments and the break down of shipping charges give you and your customers more options in payment for shipping and the UTF-8 makes label printing available for all languages. And these only the lesser used features. Find 5 reasons you should have this plugin. ELEX WooCommerce DHL Shipping Plugin with the Print Label costs you a one-time $69.00 and you are protected by our 30-Day Money Back Guarantee. It is a valuable integration to any WooCommerce store. This is because the location is not a bar for the plugin. You can use it and show shipping rates from anywhere in the world.